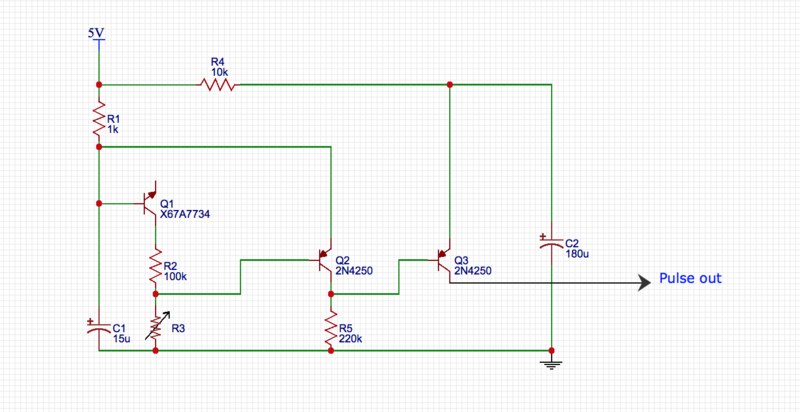 Strange BJT configuration, working as a diode? I was looking at an old schematic and I came across this strange circuit for low voltage detection section of a larger circuit (not shown). The operation of circuit is straightforward, Q1 is normally conducting and the voltage divider R2/R3 set a threshold voltage, above which, Q2 conducts. When Q2 is normally conducting, the Q3 is off due to the voltage divider R1/R5. Upon depletion of power source,R2/R3 can no longer provide the base voltage for Q2 and it turns off. The Q3 turns on and discharges C2 to provide a pulse. Does anyone know why Q1 is used in this configuration without the emitter connected to anywhere? Yes it is just a diode. There are so many clever but inefficient design choices here, I wouldn't spend much time on it. The person obviously doesn't know how to make a power on reset even with a miswired pot and 3 transistors, one of which is experimental. Why I can't get twice the input voltage from a double voltage circuit and how I can solve this? What happens when a BJT doesn't draw enough \$I_c\$ to be properly biased? Why is my relay oscillating for over a half-second?